Broadly speaking the main organs we covered were the heart, lungs, brain. Other categories include blood pressure, pulse, blood sugar levels, and oxygen levels and medication interactions. 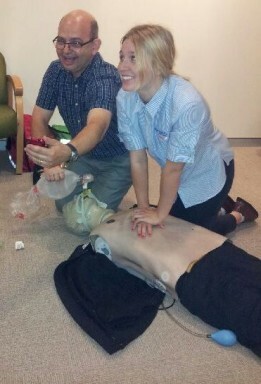 We practiced again on “George” using a defibrillator and hand compressions. Hard work! Cardiac compressions sole aim is to keep pushing blood around the cardiac arteries to keep the heart muscle electrical activity from disappearing. The defibrillator shocks the heart muscle to increase electrical activity. Crucially, there must be some electrical activity in the heart. A “flat line” of the heart is too late. The most common event in a dental surgery is fainting. It’s important to lie a person down and not sit them up. A person faints as the blood pressure has fallen that it cannot overcome gravity in getting blood to the brain. Lying down allows the blood to flow to the brain. The air way should be checked. Thankfully most dental work is carried out in a chair that is comfortable and laid back. If you have a tendency to faint, then the dentist will raise you up slowly and allow you sit for a while before standing up. Eat some food before a dental appointment will help you cope better, unless told otherwise, e.g. sedation or in general anaesthetic.